Basswood Veneer for Back and Face, Lauan Veneer for the second layer and Falcata(Eco wood) Laminated Board for Core. Less Curve and Warp. Superb finishing for its Smooth surface skin. Lauan Veneer for Back and Face, Lauan Veneer for the second layer and Falcata(Eco wood) Laminated Board for Core. Lighter and Easier to handle. Nailing is also easy at the cut end. 0.6mm thickness of Basswood Veneer for Back and Face, also for the second layer and Falcata(Eco wood) Laminated Board for Core. Very Light weight. The cut end looks so beautiful and easy to cut that it looks as Solid wood. Good for Core material. Light, Durable and easy to process. Insect Retardant. Eco wood Lumber Core Board produced by Ikutmaju factory. Falcata for Core and any other Eco wood for face veneers. 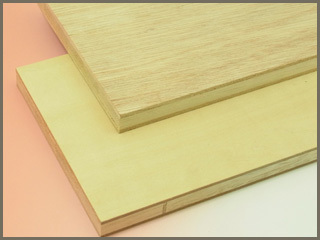 Hybrid Lumber is the combination of MDF and other Plywood Materials such as LVL, Blockboard and Laminated board.